We recently took a trip by airplane, and brought all carry-on luggage as we are too frugal to pay $25 per bag, per flight. We ended up with 3 rolling suitcases, 2 personal bags, 2 car seats, a stroller and 2 blankets, all of which had to be carried through the airport and to the gate, where they took the 2 car seats and stroller off our hands, but we still had to get on the plane with all the rest. Checked bag fees are actually a small tax on the big spenders, but that tax is all around. Look at rental cars. 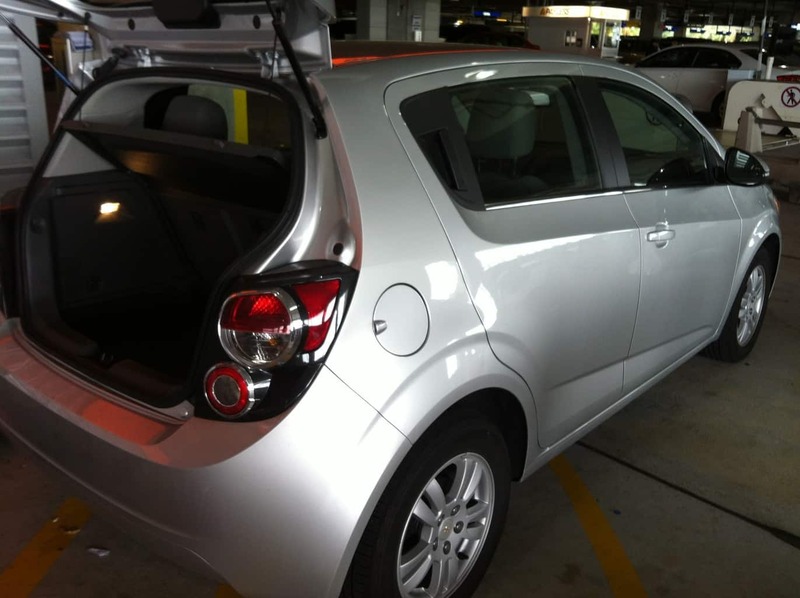 We rented the smallest car they had, and compared rental agencies before booking. We found the absolute least expensive rental we could. It was a Chevrolet Sonic. There is almost no luggage room in this car. But since we had small bags, we could squeeze everything in just fine. We also saved on gas with the Sonic’s little 4-cylinder engine. When we returned it, there was a French couple also returning their car. They left their receipt behind, so Mr. 1500 picked it up. For the same length of time, our car was $134. 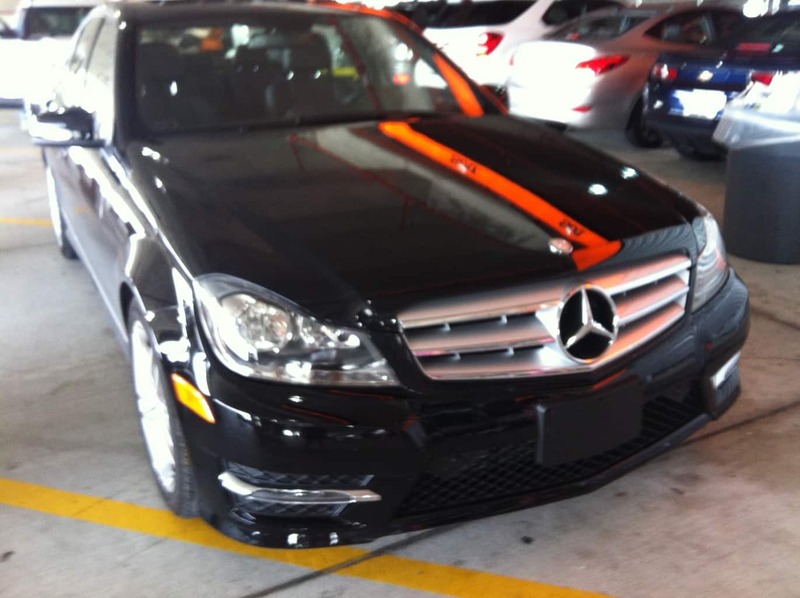 Their Mercedes cost $946. They purchased the navigation system (um, you have that on your phone), the pre-paid tolls package ($5.99/day no matter if you hit any tolls or not), and the optional insurance that we declined in favor of our own. Additionally, their base rate was twice what our rate was because they had the luxury car. As they walked past us, they had bags in their hands from all manner of expensive stores, plus those large bags that definitely won’t fit in the overhead bin. Merci, Monsieur Mathieu! But the tax doesn’t stop there. Let’s mosey on over to airline tickets themselves. You have the option to pay more for a first class ticket. A quick check shows the least expensive option in coach is $297 round trip. But the first class option is $2990. !?!? I cannot wrap my head around that price difference, so I will leave the numbers to speak for themselves. Again, people willing to pay a bunch more for silly luxuries help keep prices down for us frugal folks. But my best eye-opener was the $99/night hotel we stayed in, in Kissimmee. $99 a night might not seem like a bargain to some of you, but this was not just a room. This was a 3-bedroom condo with 2 full bathrooms, plus a full kitchen, free laundry in the condo, a dining room and an ample gathering room. We stayed here two years ago, and I was so mad that they didn’t include anything with the room, (I am talking one roll of toilet paper to get you started and no more your entire stay) that I wrote a rather scathing review on Trip Advisor. Imagine my surprise when my mother-in-law chose the exact same hotel again! But with Mr. 1500’s ‘Tax on the big spenders’ comment still ringing in my ear, I started to appreciate Caribe Cove much, much more. Do I need to pay $139 per night to get toilet paper? A full kitchen saves us tons on eating out, the laundry allows us to pack fewer suitcases and just do laundry there. Not so much fun to do laundry on vacation, but you put in the load at night and dry in the morning. They don’t provide the laundry soap, but laundry soap now comes in those little pods that are easy to pack, or even something that looks like a dryer sheet, loaded up with detergent. Bring a few dishwasher pods as well, because those aren’t provided either. But I was amazed that it only cost $99 a night for this place. We went in the off season, so don’t expect that rate in the middle of summer. I would still like to see them provide liquid dish soap. It is difficult to find the small, carry-on sizes in dish soap, and one giant bottle would last for a long time in the condo. But that was my only beef with them this time around. I thought this was going to be a suggestion for the “fair” tax system. Which would also work out to be a tax on the big spenders aswell. My friend’s husband pays extra for business class for very long flights. He is a tall person and has an income that allows him to pay the extra to arrive without leg cramps and blood clots. 1500 days? How many days left? 1400+ days left. Spinning my tires at the moment, but the journey is a long one. Another way to do it would be to charge for carry on bags and let the first checked bag on for free. That would speed up boarding. My first stop every vacation is Walmart where I buy a week’s provisions (including laundry soap). I just have to make sure everything gets used up the night before we fly home.